The Intermec ScanPlus 1802 has been discontinued. No direct replacement is available. The ScanPlus 1802 and 9735 Base Station is a high performance, compact wireless solution with an operating range of up to 50 feet from the base station. With its innovative design the ScanPlus 1802 Vista handheld barcode scanner brings cordless technology to the health care retail office and light industrial environments. The ScanPlus 1802 Vista is appropriate for a variety of applications including patient billing patient tracking medicine dispensing UPN compliance price management asset-document tracking and PC fabrication and assembly. 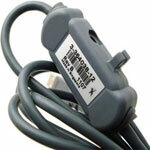 Scanning is easier when all barcodes are within your reach and there is no cable to become entangled or damaged. The ScanPlus 1802 Vista scanner offers the exceptional speed and performance of Intermec's patented Vista technology for fast reading and decoding of all barcodes including damaged or very small codes. Cable (6 feet, USB, Windows 98, 2000 and Apple MAC) for the 1800. The Intermec 1802 and 9735 Base Station is a high performance, compact wireless solution designed for retail, office, healthcare and light industrial applications. With an operating range of up to 15m (50ft) from the base station, and the autonomy of 7,000 scans from the NiMH battery technology, the 1802 offers exceptional mobility and enhanced productivity for your operation. With an operating range of up to 15m or approximately 50 feet, and autonomy of 7,000 scans, the 1802 offers exceptional performance in a wireless solution. The battery pack (NiMH technology) is quickly recharged by the advanced two bay high-speed charger for another full shift of intensive use. In addition, the ScanPlus 1802 uses the latest scanning technology for fast reading and decoding. With a choice of CCD or laser scanning devices, and the capability to connect with more than 1500 interfaces, the 1802 can meet your requirements for even the most demanding applications. The narrow band technology (433MHz and 908MHz) of the <<$mfg->name>> ScanPlus 1802 allows very efficient data transmission. As a result, the two way communication system between the scanner and its base station allows real time transmission control and acknowledgement, ensuring complete reliability in your operation critical data. 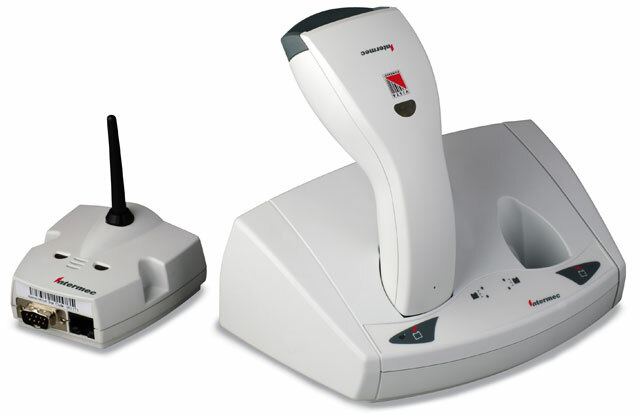 The MicroBarTM 9735 base station can interface with multiple wireless scanners and up to four input devices. This capability of interfacing multiple scanners to a unique base provides an extremely cost efficient solution for your overall operation. 1802 ST only: US DHHS Standard 21 CFR 1040, 10 and 1040,11 (1994) as a Class II Laser product, IEC 825-1 (1993), EN60825-1 (1994) Class 2. Advanced Data formatting: Pre and postambules (20 characters + 2 characters for AIM symbology identifiers), port address (15 characters), masking and re-ordering function. Microprocessor: Custom chip (ASIC inc. DSP processor) for fast signal processing and decoding. UPC E, A, EAN, Code 39; Interleaved, Matrix, Industrial and standard 2 of 5; Code 128, UCC EAN 128, Codabar, Code 93, MSI, Plessey. Some approvals and features may vary by country and may change without notice. Please check with your local Intermec <<$mfg->name>> ScanPlus 1802 sales office for further information.